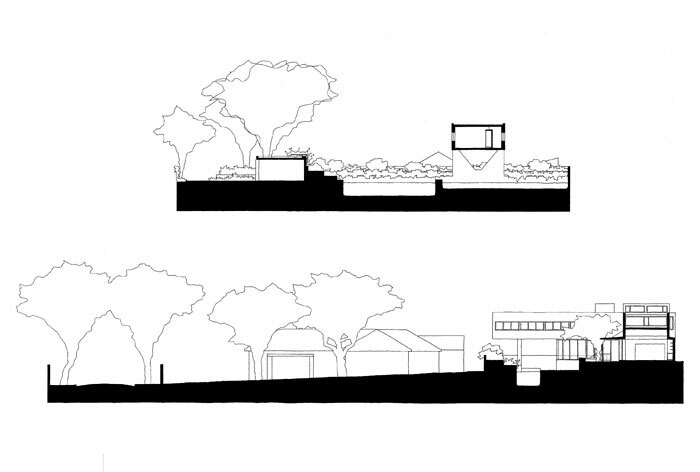 In time, the building will be a secondary layer behind the primary structure of trees and shrubs. 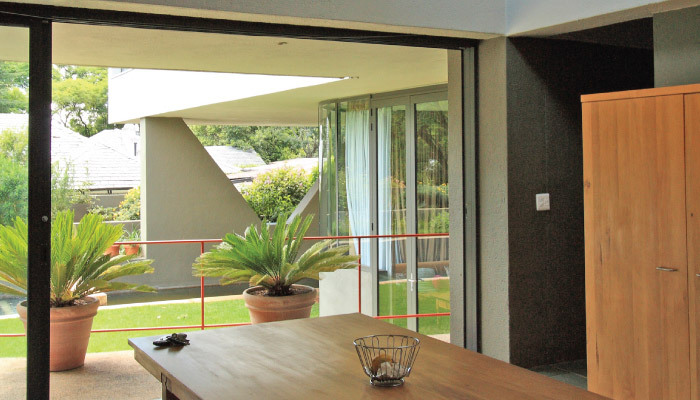 The site for this house is on a pan-handle off a beautiful Jacarada lined street in Melrose, Johannesburg. Just like the street makes a spatial structure of natural elements so the garden of this house is the main space of the architecture. Everything else is secondary. With the garden in its infancy the architecture is more dominant than it would be once the garden has matured. On this relatively featureless site, a dramatic landscape section was invented that is the focus of the internal spaces. 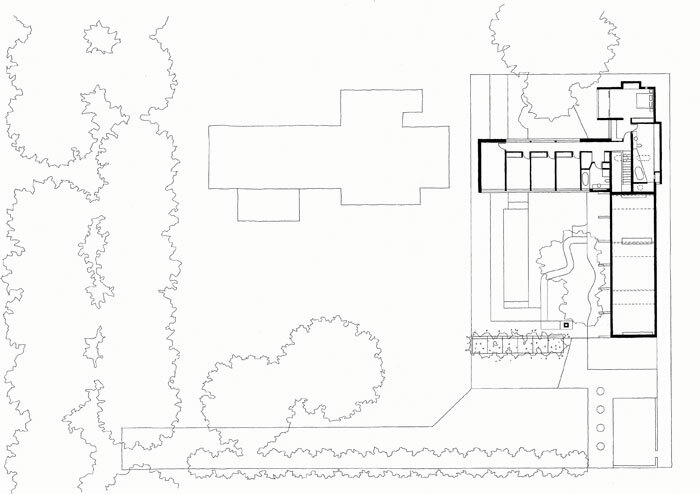 The garden architecture makes a base for the sculptural forms of the house. 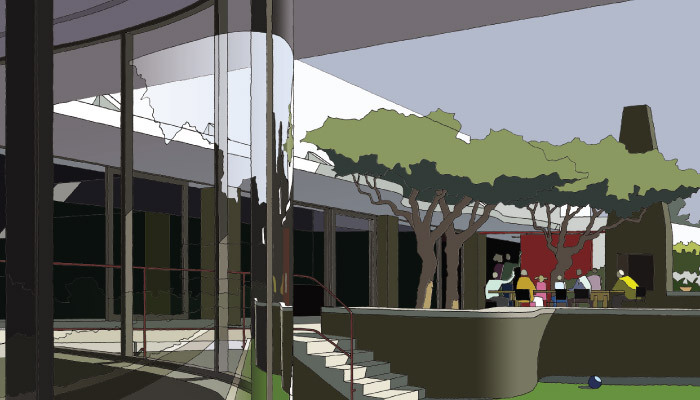 In time, the building will be a secondary layer behind the primary structure of trees and shrubs. Canopies are cut away to make room for trees. The clients were advised that their brief implied a house that was almost too big for the site. 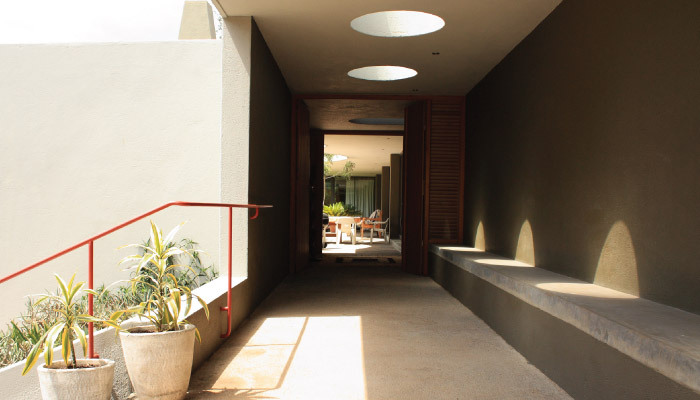 To maximize the garden space the children’s bedroom wing was built in the air, bridging over the pool and fishpond. Just like the garden borrows space underneath the children’s wing, the view from the children’s bedrooms is over the garage to the trees of the suburb. 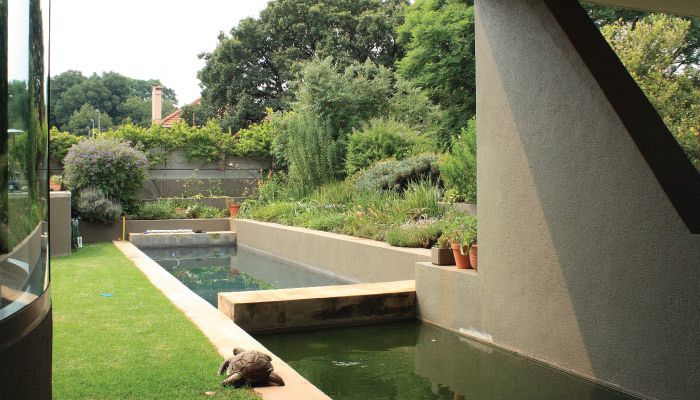 The terraces diminish the spatial impact of the boundary walls and with the pool and fishpond they exaggerate the elongated character of the garden. The trees next to the living/dining/kitchen area will allow light to filter trough their leaves and branches into the living spaces in the morning. 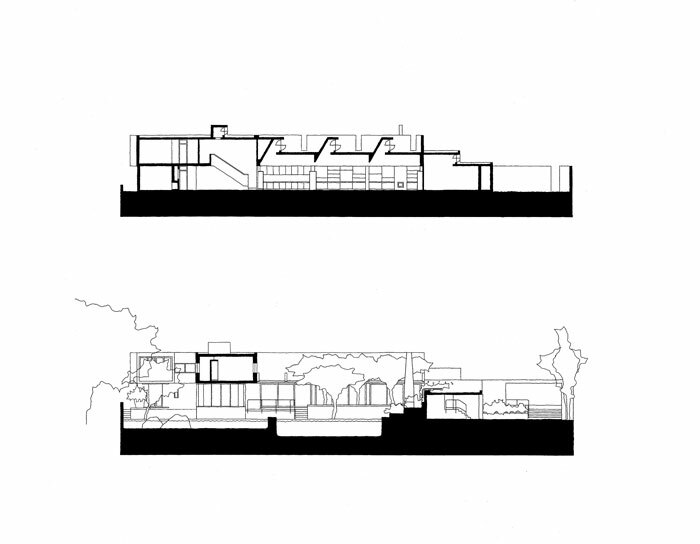 To avoid these trees blocking the north sun, three high level windows were created with light scoops that cut into the rectangular volume of the living space and give definition to each of the sub-spaces. 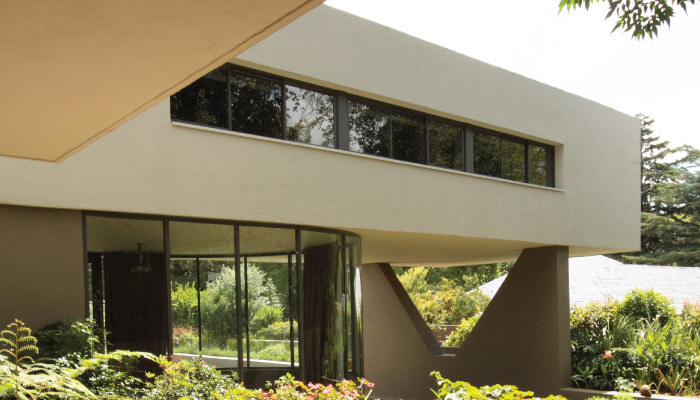 The formal strength of these light scoops (as revealed in section) is concealed to the outside to maintain a domestic quality and to ensure the secondary nature of the building relative to the garden. 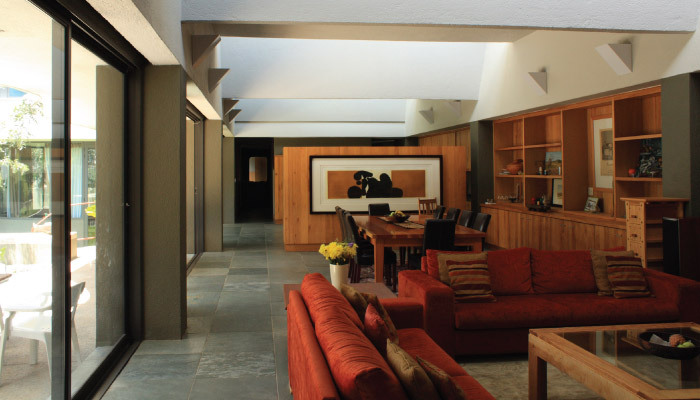 The ceilings were developed as the dominant architectural element of the house. The house is for a large family, who should be free to live in the house as they want; floors are either filled with furniture or covered with planting in the garden, walls should not to be precious and can be covered with shelves, paintings, curtains, drawing, etc. The only surface that remains to give definition and character to the space is the ceiling. The most important aspect of the children’s wing is its ceiling that extends from inside the house far out into the garden. 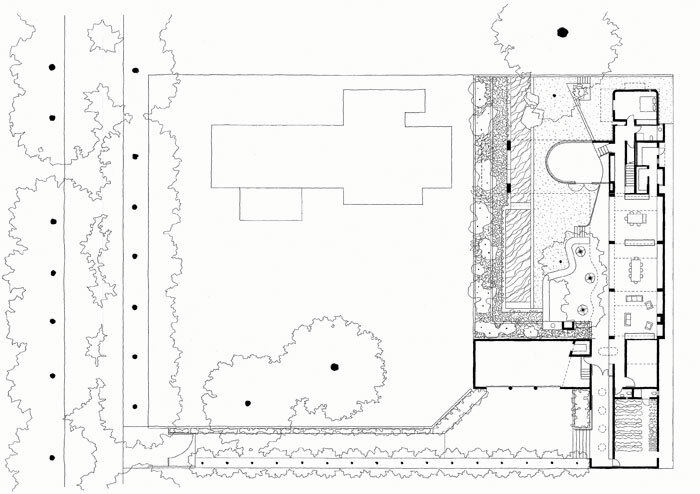 This devise brings together the two main structural aspects of the architecture – the ceiling and the garden.